Includes one each of 10.5", 16" and 19.5"
Looking for our Mini Tabletop Christmas Trees? Need mini-sized Christmas Trees for your apartment, dorm, mantle or tabletop? With our elegant modern christmas tree set with acacia wood bases, we've got just what you need. Our mantle-top sized modern christmas trees will be one of your favorite holiday decor items. Transform your interior in the blink of an eye with our unique Christmas decor ideas collection. Price is for a set of 3: includes one each of 10.5", 16" and 19.5"
For a matching look, check our Christmas Decorating Ideas. 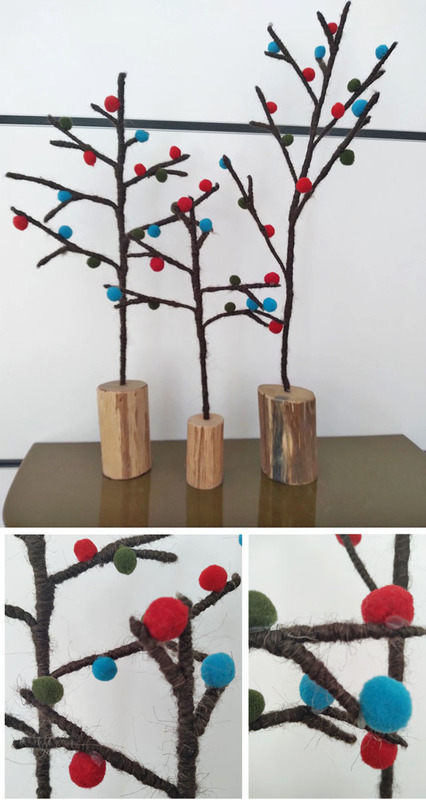 Hand-crafted trees are fashioned from soft natural wool fibers and vibrantly topped christmas balls in wool. Easy to place on mantle or table. Ships in standard cardboard box. Price is for 3 (tree) trees. In stock, usually ships in 2-4 business day.